A couple of weeks ago I had the pleasure of connecting with Cheryl Parrish, the Children’s Ministry Director for Liberty Hill General Baptist Church in Dexter, Missouri. 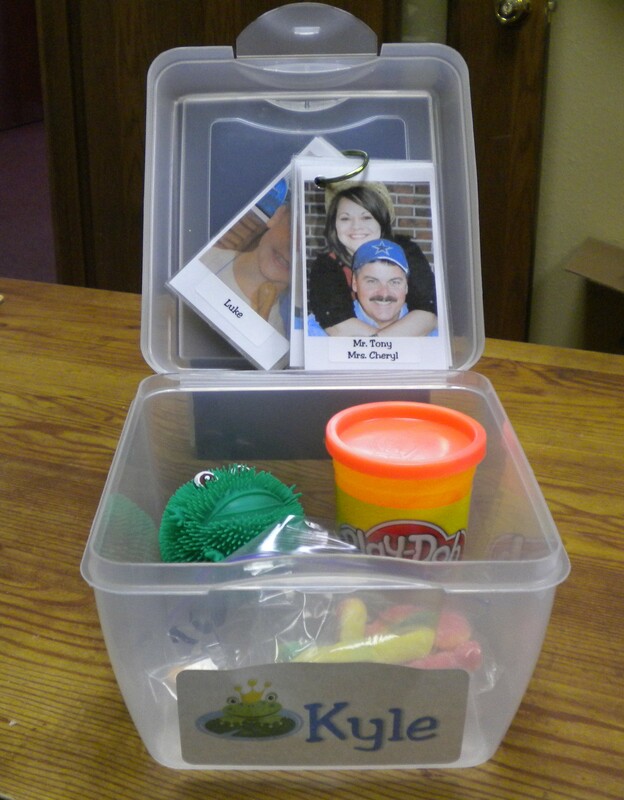 Cheryl and I were talking special needs inclusion when she mentioned something about a “Transitions Box” she had created for one of her kidmin students. I stopped Cheryl mid-thought and said “wait, what’s a transitions box?” That is the story behind today’s guest post, written by Cheryl. Liberty Hill General Baptist Church may have 200 people total participate on any given Sunday morning. Most weekends, that number includes ten children with identified special needs. For more on Liberty Hill Kids see their Facebook page. Kyle is age nine, in the 3rd grade and has Autism as an attribute. When Kyle began attending our church he was resistant to leaving his brother or mother. We wanted Kyle to participate in our church and so we allowed him to attend Sunday school alongside his older brother, even though this class was not Kyle’s age-appropriate environment. Similarly Kyle would not attend children’s church, fearful of being away from his mother. Kyle’s mother had privately shared her desire for a more focused and attentive worship experience for herself and she wanted Kyle to attend children’s church. It was then that I made it a personal goal to get Kyle to come to children’s church. I invited him every week without being pushy but reminding Kyle of the fun he was missing. Remembering I had some treats on hand, one week I told Kyle I had a prize for him if he would come to children’s church that day. After showing him the “prize”, he agreed to stay. The first Sunday Kyle participated in Children’s church he had a good experience. The following week, he came to children’s church with no incentive, but after his mother left him he appeared anxious, crying loudly while separating himself from the group. A children’s ministry volunteer, who is also a speech therapist working with children with autism, was pulled in to help Kyle. This volunteer calmed him by engaging him in a simple activity. Eventually Kyle re-joined the group on his own. Afterward, I spoke with this helper and she explained that it can be futile to attempt to reason with a child in situations like Kyle had experienced that day. She mentioned that she had seen transition boxes used in school settings to help ease anxiety associated with a change in class or activity. In the meantime and after a lengthy discussion with Kyle’s mother I learned that Kyle tends to get really uncomfortable when he doesn’t know people well. Kyle’s family reviews pictures of kids from his class with him to help him “get to know” his peers and develop familiarity with his school. From our experience with Kyle and a little investigation, the ideas for Kyle’s transition box came together (see below). Kyle knows where to find his personal box each week and he is provided 5 minutes of “transition box time” as soon as he enters his class. Some weeks he only wants his box long enough to find his treat and other weeks he doesn’t need it at all. But the box has provided a source of comfort for him. We have been amazed to see how a plastic box has been the key to a successful church experience for not only Kyle, but also his entire family and the volunteers working alongside Kyle. A sensory toy associated with something Kyle loves (Frogs). ~ Cheryl Parrish, Children’s Ministry Director for Liberty Hill General Baptist Church in Dexter, MO. For a wonderful article about Kyle and his family, read this article from The Daily Statesman daily newspaper. To read about movable schedules introduced at Liberty Hill, see Special Needs Inclusion Strategies – Movable Visual Schedules (and Thoughts for Small Churches). H! I’m Kyle’s Mom and I would like to say the transition box has been the best thing that has happened to Kyle at Church. Well right after meeting Mrs. Cheryl!!! I could not listen or be attentive to the sermon because of Kyle climbing over me and now he is going to children church and loving it. It is amazing how a little box can change a person’s life. He is now listening and paying attention to lessons and learning about God’s word. Thank you so much for giving us blessing to run this story about Kyle and the Transitions Box! The readers of this blog love it — as I am receiving wonderful emails and feedback. Your church (Cheryl!) sets a beautiful example of what it looks like to successfully include a child with special needs. And I LOVE the story about your family and Kyle’s adoption (that newspaper article is so inspiring). Great post!! I will keep this one in mind for sure. Thank you. that is a wonderful idea! Our school uses a similar idea with my son. It really does help a lot. I especially love the photo cards. This is a great idea for a transition box and what you might include. The suggestion to speak with the child’s parents to gain insight and include them in how you can help their child have a successfully fun time in class is really good and something for me to remember. Thank you for sharing. Thank you for sharing. God provides! Love this idea. I have many items i can give my son to transition but this idea of setting a small box for him with things he loves and soothe him is so simple to do and personal i know my son would love it, Thank you for sharing!!! This sounds like a great idea! It might even come in handy for a younger child (not necessarily special needs, even) who is having difficulty transitioning to a new church or after a tough life experience. I will certainly be passing this on! We have a first grader who has special needs and is having difficulty in our Wednesday programs. I am in the process of making a transition box for him because he has a hard time with any kind of transition within the class. I do have a question about the box: does the child carry the box around with in or does he just pull out an item from the box and when do you give him the “treat”? I love the idea about the pictures too and I will be enlisting the help of his mom to find things that he likes to put in the box. Any suggestions or insights would be of great help.